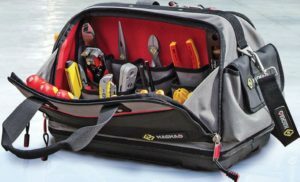 Following the success of its range of premium storage tool cases, Carl Kammerling International is enhancing its range with the new C.K Magma Pro Tool Case Plus (MA2640), the ultimate bag to organise and protect tradesmen’s tools. Regularly working with tradesmen gives C.K Magma valuable insight into what works best. As a result, the C.K Magma Pro Tool Case Plus provides the latest vertical tool storage facility, which not only offers perfect organisation within the tool bag, with a place for every tool, but also helps prevent any tools being lost, which can be extremely costly.